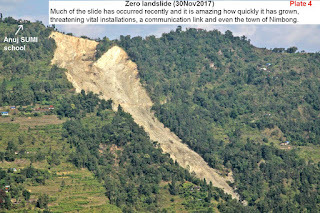 SaveTheHills(STH) is a group of concerned citizens who are raising awareness about landslides in Darjeeling-Sikkim Himalaya. 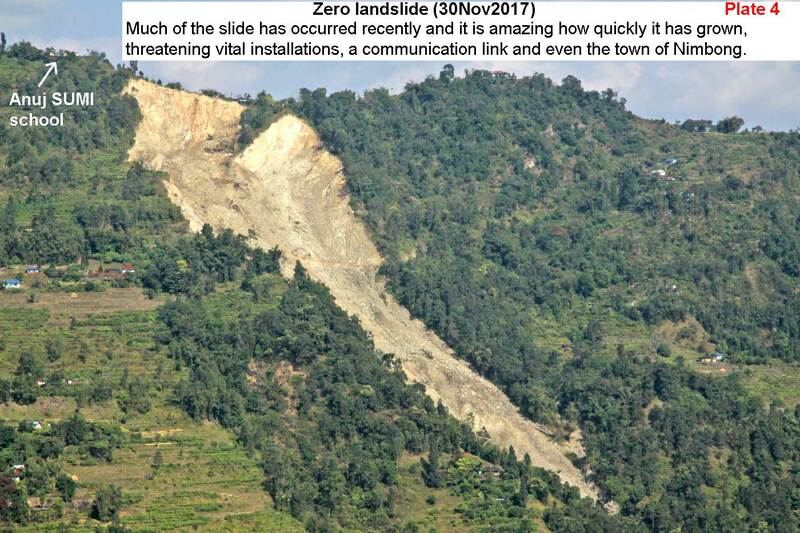 Many landslides are the direct or indirect result of human interference and preventable if sufficient care is taken. As such, unless we begin a comprehensive and sustained program towards landslide management, prevention and mitigation, the consequences of ignoring years of human callousness will, in the future be devastating. (BDO - 1). The gram panchayat has a population of approx 8000 but the town has a population of 2659 (Census 2011). Agriculture is the main source of livelihood here. Being located on the foothills, heavy rainfall associated with thundershowers is a normal phenomenon during the monsoons. Nimbong is no stranger to landslides with 36 people dying in 1996 and a huge landslide being located at Central Gaon which was reported by SaveTheHills (STH) in July2009 (see STH blog of that month). While the Central Gaon landslide seems to have somewhat stabilized, another landslide seems to be wreaking havoc in Nimbong. This is the landslide at Zero. 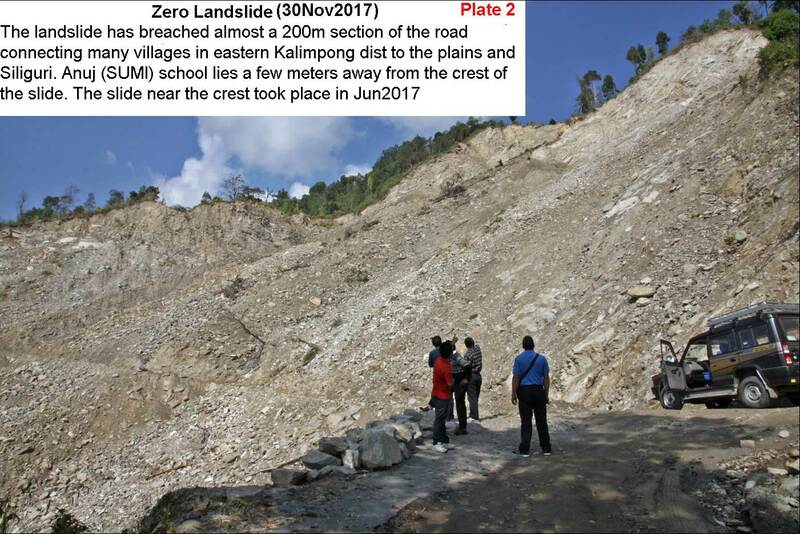 It has breached 200m of the vital road connection which links Nimbong, Lava, Samthar, Pabringtarm, Ghanti Dara with Kalimpong and the plains of the Dooars and Siliguri. It directly threatens Anuj SUMI school, a branch of SUMI school (Kalimpong) with approx 250 students. The landslide crown being barely 200m from Nimbong town also puts the entire town in grave danger in the long term. 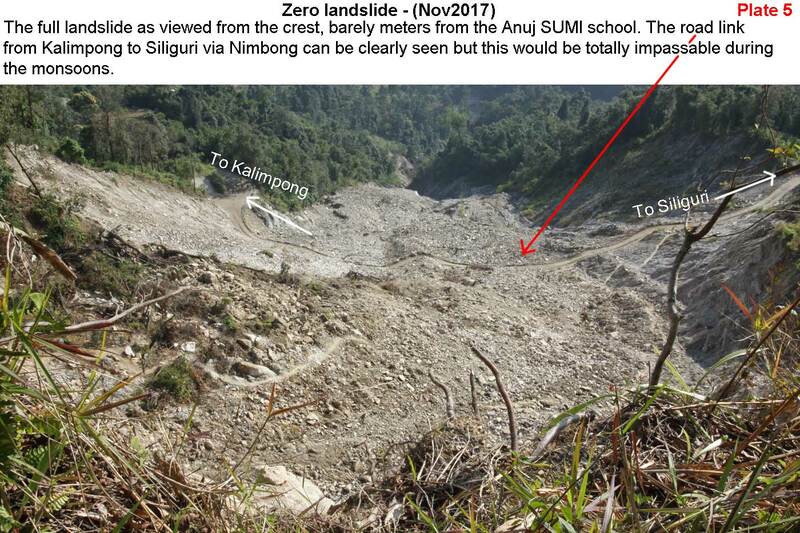 As per locals who were interviewed, the landslide started in 2012 as a minor ‘crack’ on the road below the Anuj (SUMI) school. It slowly became a ‘sinking area’ and this subsidence area on the road became a full blown landslide in 2015. 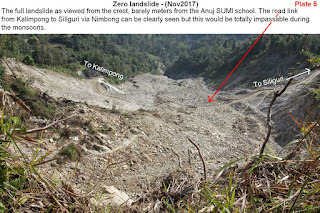 The landslide has been increasing in size since then and in 2016 it totally cut off Kalimpong-Nimbong-Siliguri link. This necessitated an alternate diversionary route across the slide made below the Anuj SUMI School and constructed through MNREGA. This road too was pulled down by the slide in Jun2017. There are numerous natural springs in this area which sprout water and which has been used as a source of drinking water and agriculture by the surrounding villages for decades. 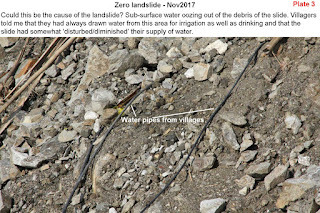 These sub-surface water sources as per locals caused sinking zones on the Kalimpong- Nimbong- Siliguri road in this area which eventually caused the landslide. 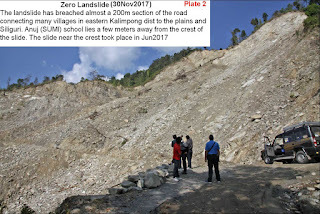 Though Nimbong town is in the vicinity, the urban sprawl is still small and may not be contributing significantly to surface run-off and eventual erosion by jhoras which is a major cause of landslides in Kalimpong district. A small river or jhora flows at the base of Zero landslide but the impact of erosion caused by this on the landslide also appears negligible. There have been no major land use / land cover changes in the recent past which could have contributed to the slide. The Kalimpong-Nimbong-Siliguri road which has been cut off by the landslide was constructed in the 1970s. Lying in the foothills of North Bengal, this area receives heavy rain during the monsoons in the form of intense thundershowers. This certainly is a major trigger for landslides in this area. Unfortunately, rainfall data of this region was not available to STH. 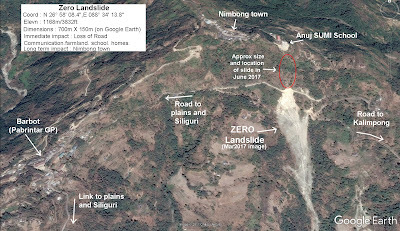 Coordinates: N 26° 58' 08.4", E 088° 34' 13.8"
The landslide today is huge, measured on Google Earth the length from the crown (just a few meters below the school) till the base is approx 700m. The width at the road is approx 150m. Till date the landslide has not resulted in any human casualties, even though locals have reported loss of livestock. As on date five families have been relocated and along with property, livelihoods and farmland has been lost. Destroy a number of homes which lie on the edge of the landslide zone. Destroy a heritage Church built in 1886. Destroy the Nimbong Panchayat office. Breach the Kalimpong –Nimbong-Siliguri road which will effectively isolate large areas of eastern Kalimpong district. 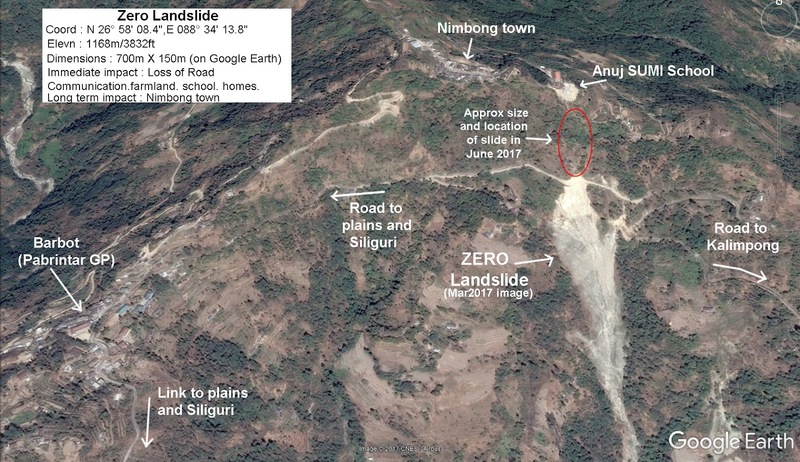 A proper scientific investigation may be done (by the GSI) immediately to find the cause of the landslide and to suggest measures to mitigate further damage. Emergency landslide protection measures which include bio-engineering (vetiver, bamboo check dams etc ) as well as other engineering methods maybe commenced so as to stabilize the area before the next monsoons. Rainfall data may be obtained and correlated to the activity of the Zero landslide. Manual rainfall gauges may be made available and rainfall data be maintained at Nimbong. All inhabitants in the vicinity of the landslide may be made aware of the danger posed by the landslide especially during heavy rain or even minor earthquakes. Internet and phone connectivity maybe improved in the area with a view to communicate weather warnings. SaveTheHills (STH) is a Kalimpong based NGO working towards raising awareness about landslides in the Darjeeling-Sikkim Himalaya which is one of the most landslide prone areas of the world. The hundreds of articles, images, maps and video clips on this blog bear testimony to a fact which has long been ignored but which can only be ignored further at a terrible cost.